Evolve is a jetpack dance between prey and predator. It’s a multiplayer tango with ever-shifting positions: in a typical round, you go from being a frag god to fragile and back again in the span of about 12 minutes. One moment you’re a firebreathing Goliath, rolling a strike through Evolve’s four Hunters with an enormous boulder, and the next, you’re a fleeing, bloodied heap, scraping the map for alien wildlife to chew to regain lost armor. Evolve can turn on a dime. Its rhythm differs slightly between map and mode, but generally speaking this is the most compressed multiplayer FPS since Titanfall. For the four Hunters, Evolve is all about pursuit—of the monster, or a separate map objective—with few moments granted to plot, joke, or catch your breath. That pace instills Evolve with a feeling of constant urgency that I like, but it also makes it more ephemeral than other multiplayer FPSes. Evolve’s four-versus-one format is exactly the sort of asymmetry we need more of in the genre, but I rarely walk away from it with water-cooler war stories that I can’t wait to tell, something Left 4 Dead provided plenty of. Lazarus' gun marks the monster with diamond-shaped targets that amplify damage when other Hunters hit them. Unlike Evolve’s zombie ancestor, though, Evolve is a fleshed-out competitive game, and the most ambitiously asymmetrical entry in the genre since Rising Storm. Evolve’s dozen Hunters—three for each of its four classes, with more on the way as paid DLC—form a spectrum of interesting playstyles of mechanics. Bucket, one of the Supports, unscrews his robot head for use as an UAV and spits out guided missiles and sentry guns. Cabot, another Support, is the only Hunter who can shoot through objects (with his rail cannon). Lazarus is a medic that heals by letting teammates die, then quickly reviving them. The ability variety is vast—comparable to a MOBA, but not spread across a hundred characters. And along those lines, these weapons and abilities have their own specific skillshots and maneuvers that I’ve enjoyed mastering. Caira’s healing grenade launcher isn’t fancy, but it takes some brain math to manage your position and timing so that you’re healing multiple teammates with each shot, maximizing your efficiency. Turtle Rock extends that “easy to learn, hard to master” virtue across most of the experience and Evolve benefits immensely from it. Movement is as straightforward as it can be in this context (exception: the Kraken, who handles like an overweight kite), and movement-based abilities like Goliath’s leaping ground-pound employ helpful UI for targeting. In general, movement has a wonderful skill ceiling in Evolve. On both the monster and Hunter sides there’s a focus on cooldown management that I like. The Hunters’ jetpacks always feel starved, and knowing when to spend and save that energy becomes a big skill. Conserving as much jump juice as possible as you’re trying to keep up with a beast who’s straight-up quicker than you creates an interesting tug-of-war between your battery and the objective. The monsters have their share of tough-but-fun movement techniques to master too. Wraith became one of my favorites. More than the other two aliens, his movement style (hovering and lunging) and fragility encourages creative hit-and-run tactics. I loved frustrating Hunters with the Wraith’s decoy ability, which makes you invisible as it spawns a weaker, AI-controlled mirror-Wraith for a few moments. It’s wonderfully annoying to the Hunters, and later on I figured out that I could use my doppelganger to kill wildlife too. Pulling off Wraith’s Abduction ability at its maximum range makes you feel like a horror movie monster and Robin Hood at the same time. You aim yourself, fire, then close the linear distance like a rocket. If you connect with a Hunter or wildlife, you’ll grab them, then pull them away from their friends and back to your original position. It’s like playing Left 4 Dead’s Smoker at a graduate level. Generally speaking this is the most compressed multiplayer FPS since Titanfall. That said, if there’s anything that feels unbalanced, it’s the mobility and slipperiness of the Wraith—in the hands of a skilled player, you’ll be chasing for the entire match. On the Hunter side, Abe’s stasis grenades are frustratingly hard to wriggle free from and can’t be destroyed. I’d love to see his tracking dart duration (45 seconds) or range nerfed too. A better solution for this would be a banning or drafting system, like Dota 2’s, where certain one monster or a few Hunters could be eliminated. This doesn’t jive with Evolve’s progression system, of course, which gates access to characters. Evolve is best in Evacuation, where a group plays five successive rounds on a mix of maps and modes. This format doesn’t address what I criticized at the beginning of this review—Evolve’s ephemeral nature—but it does at least form a bit of history between players and create the opportunity for comebacks, even if the specific events of a round rarely stick in your brain. Other than Hunt, the three other modes within Evacuation (which can all be played individually), do an okay job of stimulating different playing styles and strategies. Nest, where the Hunters have to destroy six monster eggs scattered across the map, is probably my favorite. I like that the Hunters have to decide if, when, and how much to split up, a maneuver that makes them more vulnerable but means they’ll break the eggs more quickly. Nest also prompts important choices around team composition, as it increases the utility of some Hunters’ abilities, like Bucket’s sentry guns. In one of my favorite Nest rounds I enclosed myself and the monster in the Orbital Arena, the Trapper’s class ability. I’d put myself in a one-on-one cage match against a Kaiju. As I was getting the HP kicked out of me, my teammates were able to kill another pair of eggs. Short, map-specific cutscenes provide tiny payoffs after each win or loss. Despite their simplicity, Nest, Rescue, and Defend have some good tactical wrinkles. The monster can sacrifice an egg in Nest to turn it into an AI-controlled Goliath minion. The monster must decide whether to attack colonists early on in Rescue, or to let the first few escape and spend the beginning of the match leveling up. But there are also moments when these modes feel mundane. The objectives—shooting static eggs, moving to a waypoint and reviving AI, or in Defend, waiting for the monster to come to you—don’t generate fun in isolation. Evolve’s fun relies on the monster stirring up trouble. Evolve also leans heavily on its matchmaking system. It takes coordinated, acrobatic Hunters to keep pace with a fast, experienced monster. It takes a clever, competent monster to challenge Hunters who know every trick. Most of my solo matches have put me in satisfyingly tough games—nearly every time I played alone it felt like I was being exposed to new tactics or breathing a sigh of relief once the match was over. At this stage of Evolve’s lifespan I’m happy that no single maneuver or team configuration is being abused. I also like how aggressive Evolve is about throwing you into existing games when you matchmake, which you can’t opt out of. Unfortunately, though, it’s annoyingly easy for players to leave in the middle of a match—the requeueing penalty for abandoning is a 60-second timeout, far too mild. A pick/ban system, like that of LoL or Dota 2, would've been a welcome addition. I had a worse time when I queued with players of mixed skill levels. That isn’t a fault of the matchmaking—Evolve’s balance is such that a Hunter team is only as strong as its least agile member (especially if that person’s playing as Trapper or Medic), something to take into account if you’re playing with friends. Luckily, this is less of an issue in Evacuation, which unlike Skirmish has a mechanism that balances the match over time. If a team loses a round, they get a buff in the following round. Annoyingly, it’s unclear whether these buffs influence HP or damage output and to what degree. But they are cumulative: if you continue to lose, you’ll get stronger. The competitive purist in me doesn’t like the idea of core player stats being tampered with, but in practice it does make one-sided shutouts unlikely in Evacuation, which I like. Also, you can disable autobalance altogether by creating a custom Evacuation match. Still, what bugs me about this system in ranked play is that it doesn’t appear to take the level of victory into account. If the Hunters put three narrow wins together, they’ll come into the fourth round with three “balances” against them, which seems unnecessary. My feelings about Evolve’s maps couldn’t be more mixed. Evening the scales, however, are Evolve’s “map effects.” When one team wins an Evacuation round, they earn a map bonus in the next round, like clear weather for easier monster-spotting, armed AI colonists, or static teleporters. A victorious monster might unlock electric eels in the next map’s rivers and ponds, or radioactive gas that damages the Hunters. I like the balance that these effects strike between being surprising and unobtrusive. My feelings about Evolve’s maps couldn’t be more mixed. There are 16 of them (four are only playable on Defend), and individually they’re well-designed, spacious arenas populated by rock pillars, rivers that hide the monster’s footprints, and a mixture of deadly and docile wildlife to impede the Hunters and feed the monster. But the maps are also surprisingly homogeneous. I can’t think of a moment where being placed on a particular map meant that I had to change my tactics. The maps are excellent jungle gyms for the Hunters and the monster to fly, chase, and clamber over. But collectively, they all share same general shape and rocky, overgrown texture, and the few map-specific features within them don’t prompt different playstyles. This is something that will erode Evolve’s replay value over time. It means something to be on cs_office in Counter-Strike, or on Operation Locker in Battlefield 4, and I wish Evolve’s maps had more meaning within its systems. Goliath: half Hulk, half King Kong. When human players aren’t around, leave a match, or you decide to play alone, the AI that fills the shoes of Evolve’s Hunters and monsters is flawed but usually competent enough to not get you killed. The AI Hunters’ greatest shortcoming is their limited autonomy. Blast an egg in Nest to half health and run away, for example, and your teammates won’t stick around to finish the job. The bots are fine at the basics: traversing Evolve’s cavernous layouts, doing damage, healing the player being attacked. 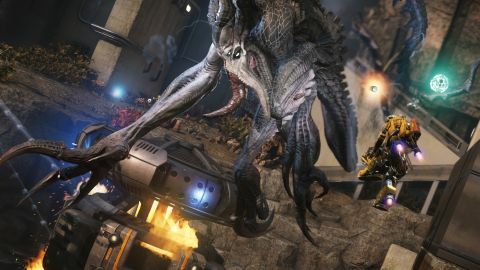 Especially on the monster side, though, the AI lacks the creativity to truly take advantage of Evolve’s weird weapons and abilities, and ends up doing the safe, predictable thing in most scenarios. Still, considering the scale and variety of Evolve, functional bots are impressive enough. Given how much your time in Evolve is spent chasing, it’s appropriate that structurally, a night of Evolve feels like a series of sprints. If you lose, a rematch is a 10-minute proposition, something that counterbalances Evolve’s intensity. But after unlocking every Hunter, monster, passive stat-boost, and playing every combination of map and mode, I’m less motivated to keep playing. I wish Turtle Rock would’ve doubled-down on Evolve’s competitive focus and built a ranking system like that of League of Legends or StarCraft 2. I want to dive into granular stats that help me diagnose why I’m a bad Kraken. I want my in-game rank to be a front-and-center badge of honor, a measuring stick that motivates me to get better. It’s a shame that this type of system isn’t present, because Evolve has the competitive depth to support it. Its emphasis on skillful movement, spotting, and out-maneuvering your opponent are unique. The Hunters and monsters have some of the most elegant, simple-but-deep mechanics I’ve laid hands on. And Evolve is one of the best-looking games on PC, blessed with splashy particle effects, smart UI, and monsters worthy of Pacific Rim. But I’m concerned about Evolve’s longevity. At first touch, Turtle Rock’s 4v1 formula has tons of novelty. But without maps that bolster its replay value, or mod support to fill in, I worry about how well Evolve’s paid DLC and Evolve’s planned free map releases will keep pace with players’ fatigue.